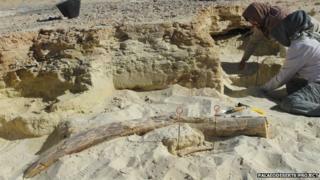 Deep in the deserts of Saudi Arabia, a team led by Oxford University has made a startling discovery: a giant, 325,000-year-old tusk belonging to an extinct species of elephant, remarkably preserved and embedded by an ancient lake. It is vivid proof, say archaeologists, that giant beasts once roamed lush and fertile plains where today the wind-blown sand covers the searing Nafud Desert. Picture the Nafud Desert and it is almost impossible to imagine it as anything other than a place of heat, wind and sand. Yet scratch beneath the surface, as an international team of archaeologists have been doing, and there is evidence of a green and wet landscape where huge animals once hunted and foraged. "Using satellite technology to map out the terrain, we predict there are tens of thousands of unknown archaeological sites in the Arabian Desert," says project leader Prof Mike Petraglia. "There are over 7,000 [dried-up] lake beds on the peninsula, most in Saudi Arabia." The five-year "Palaeodeserts Project" is funded by the European Research Council and is a joint venture between the University of Oxford and the Saudi Commission for Tourism and Antiquities (SCTA). Excavations began in 2013. Members of the 30-plus-strong team are presenting their findings this week at a three-day "Green Arabia" conference at Oxford University. Senior Saudi princes are flying in for the event which will examine how early humans and animals in Arabia were affected by dramatic climate change. A message of support will be read out from HRH The Prince of Wales. Together, the two pieces of excavated tusk measure 2.25m (7.4ft) and are believed to have belonged to an extinct species from the Pleistocene era, known as Palaeoloxodon. Based on the creature's carpal bone, discovered 5m away, scientists estimate it weighed 6-7 tonnes (13,300-15,400lbs), compared to 3-6 tonnes for a modern-day African elephant. They put its height at more than 3.6m (11.8ft) at the shoulder. "This individual would have been accompanied by many large animals," says Prof Petraglia. In the same sand layer as the elephant's tusk researchers have found the remains of an extinct jaguar, oryx and a member of the horse family. Prof Petraglia says this is a huge paleontological find, with fossils extending for a whole kilometre along the margins of an ancient lake. Most excitingly, he says stone tools have also been discovered around the edges, believed to be signs of early human life. "The Arabian desert," he says, "was green many times. Environmental change may have led to flexible responses in humans."